You Collect The Payments! Increase Your Event Revenue Today! Your event will generate revenue both before and after! And racers will love that you’re helping them toss out unsafe safety pins. 4 Don’t have time? We can DROP SHIP to participants for you. No work on your part! 5 Sit back and collect the money and we do the fulfillment. Your racers are thirsting for race memorabilia. They’ll jump at the chance to buy your race event specific BibBoards with your current race logo emblazoned right on the front. 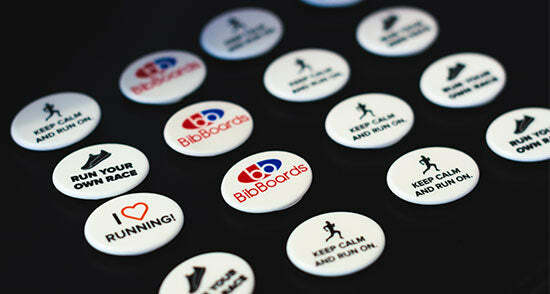 ‘‘BibBoards are an innovative new product that can help reduce waste! By creating a collectable item that runners can re-use gradually over time, races can reduce the waste footprint of safety pins throughout the industry. Imagine Your Race Being Its Own Profit Center! We can connect and implement with your registration flow company. It takes about 15 minutes to upload art and get started. Now that is easy! Connect today and generate revenue for your event! Like the ones below. How Can I Share This With The Public? Route 66’s tweet is an awesome example of how you can promote BibBoards to your followers and leverage the power of your social media platforms. If your creative juices just aren’t flowing click the link below and grab one of our templates, just customize and post. It’s seriously that easy. COLLECTIBLE – Your event attendees will wear your logo at every race, which means your race gets ongoing marketing at other events! Turn your race into a premium event and a reason for racers to attend your next event – to get the next new BibBoard collectible. Runners show other runners which means free marketing for you! Your request was submitted. We will be in touch shortly!